If you haven’t noticed in the animal kingdom, if a female species isn’t the type to bleed then she’s the type to ingest blood, and the latter is true for mosquitoes. Females need the protein, specifically isoleucine, that is found in blood to make eggs. Meaning that the hotter you are the more attractive you become. So if you are wearing all black and your friend is not the chances are the mosquitoes will go for you because black traps heat more than any other color. They also detect the heat of your blood then find the perfect capillary for them to dip their proboscis in. In regards to smells, mosquitoes are attracted to octenol (a chemical released in sweat), cholesterol, folic acid, certain bacteria, skin lotions, and perfume. Mosquitoes have been around since the Jurassic Times and it is because they are survivors. They, unintentionally, are homicidal beasts.Carrying and dispersing malaria, dengue fever and filarial worms. 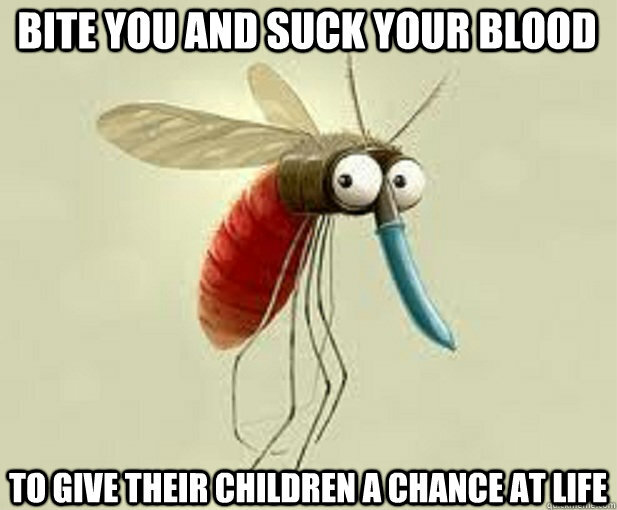 Malaria kills an estimated 1 million people every year. So when you are traveling take head to the mosquito warnings and make sure to protect yourself!